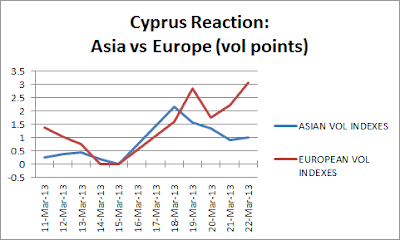 I do not have to write about credit developments in Cyprus that came out over the last weekend. What followed over the next five days shows an interesting dichotomy between reaction from volatility indexes in Europe and Asia. At the end of preceding week, Thursday 14th and Friday 15th volatility indexes around the world were relatively low. Over the weekend - Monday to Friday all volatility indexes rose, but there was no significant difference between the continents: Asian volatility indexes rose an average 2.1 volatility points, and average of 13%. European indexes rose an average 1.6 points, and average of 11%. Not surprisingly Russian Volatility Index rose the most in Europe. 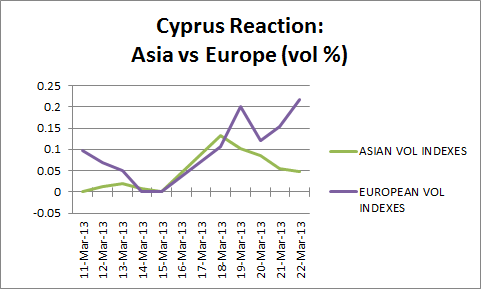 However by the weeks end the situation changed, and implied volatility in Asia started to decline. Friday to Friday Asian volatility indexes rose an average 1.0 volatility points, and average of 5%. European indexes rose an average 3 points, and average of 22%. Surprisingly (to me at least) that Russian and Polish volatility rose less that other volatility indexes in Europe. Data: For Asian volatility indexes I used VKOSPI , VNKY , VHSI, INVIXN (India), SPAVIX (Australia), and recently launched Taiwan Volatility Index. For Europe, I used RTSVX, VDAX, VSTOXX, VSMI, VAEX, VCAC, VFTSE, and my own Poland Volatility Index based on WIG20 options.